05/06/15 -- EU grains closed generally higher on the day, and for the week. 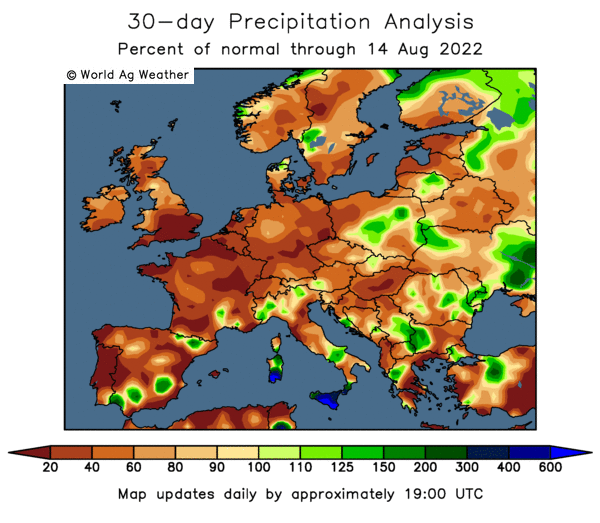 There's some concern that very warm temperatures in Spain, France, southern Germany and large parts of Poland might be causing some crop stress. Temperatures in Bordeaux rose above 35 C (or 95 F) yesterday, and are forecast to stay above normal for this time of year for at least the next week in much of France. The Paris market probably also got support from news that Greece would not be making the first of four loan payments due this month to the IMF, deferring the EUR300 million due today until the end of the month. The euro was lower on the back of that news. At the finish today Jul 15 London wheat was up GBP2.30/tonne at GBP116.55/tonne, and new crop Nov 15 rose GBP1.55/tonne to close at GBP127.30/tonne, having earlier risen above GBP128.00/tonne to post its highest trading level since mid-Apr. In Paris, Sep 15 wheat closed EUR1.00/tonne higher at EUR184.50/tonne, Aug 15 Paris corn was up EUR2.50/tonne to EUR165.00/tonne and Aug 15 Paris rapeseed jumped EUR4.50/tonne to EUR376.50/tonne. For the week that puts London wheat up GBP6.45/tonne, with Paris wheat gaining EUR8.50/tonne, corn adding EUR5.25/tonne and rapeseed advancing EUR10.75/tonne. FranceAgriMer trimmed their crop condition estimates for French wheat, barley and corn today - although wheat and barley ratings are still well ahead of where they were this time last year. They put the proportion of winter wheat rated as good to very good at 89%, down 2 points on a week ago but still 12 points better than this time last year. The proportion of the crop rated "very good" was cut from 36% to 33%. It was a similar story for winter barley, with the crop now 88% good to very good, down a point on a week ago but 14 points above 12 months previously. That included rating 29% of the crop in the top category compared to 34% a week ago. Spring barley was rated 91% good to very good versus 93% last week and 69% last year. Again the proportion of "very good" was trimmed from 26% last week to only 20% this time round. Corn rated good to very good was cut 2 points to 86%, which is now also 2 points behind this time last year. 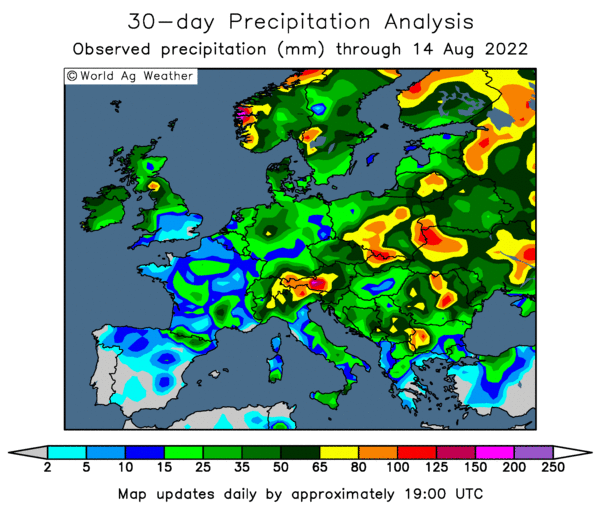 Wheat yield potential in southwestern France is falling by 200 kg/ha per day because of the warm weather, an ODA analyst told Bloomberg, but said that crop losses should be lower in other parts of the country. Nevertheless, ODA yesterday raised their forecast for French wheat yields this year to 7.7 MT/ha, a 2.9% increase on a year ago. Using the official Ag Ministry estimate of a soft wheat planted area of 5.18 million ha, that implies a French soft wheat crop of close to 40 MMT this year. France exported a fraction under 2 MMT of soft wheat in April, according to customs data. That's down 4% compared to March, but still a respectable volume as the previous month was the highest in over a year. Jul/Apr shipments are now 16.1 MMT, similar to those of a year ago. The French Ministry currently predict full season exports of 18.26 MMT, a 4.75% decline year-on-year. French barley exports in April meanwhile jumped 150% to 725 TMT on strong demand from China who took 60% of that total. Customs data shows a slow down in French exports this week, with the port of Rouen only handling 171,474 MT of grain cargoes, a 22% decline compared with the previous week. Soft wheat accounted for 123,410 MT of that total, with Algeria the leading home. Feed barley exports totalled 44,183 MT, with China once again the top destination. Brussels said that they'd issued 481 TMT worth of EU soft wheat export licences this past week, taking the season to date total to 29.8 MMT, up 11.6% on 26.7 MMT this time a year ago. Barley export licences now stand at 8.5 MMT meanwhile, a 60% leap compared with 12 months ago. Rapeseed prices have risen this week on reports of fairly widespread frost damage to Canadian canola last weekend. The Government of Saskatchewan yesterday reported 44% of this year's canola crop to be in good to excellent condition versus 87% this time a year ago. The proportion of the crop rated poor to very poor was 22% compared to just 1% this time last year. Dryness remains a serious issue. Egypt have been quiet on the international tender front lately. They say that they've now bought over 5 MMT of wheat on the domestic market, and will probably finish up taking around 5.3 MMT, far more than the originally intended 3.7 MMT. The price they are paying is well above current world levels, hence grower eagerness to sell to the government. Things have finally dried out a bit in Kazakhstan, allowing farmers there to get 12.35 million ha of spring grains sown, although that's only 84% of the government target and around 2 million ha less than this time last year. Russian spring plantings are now officially approaching 95% complete, with wheat nearly 97% sown, according to their Ag Ministry. There's some talk of heat and dryness issues here too. 04/06/15 -- Soycomplex: Beans closed higher, helped by weekly export sales that came in at 130,300 MT of old crop and 347,000 MT of new crop. Actual shipments are slowing up though, at 224,800 MT these were down 36 percent from the previous week and 9 percent below the prior 4-week average. Even so, the US has already shipped out 46.6 MMT of soybeans this season, with a further 3.5 MMT of outstanding sales taking total commitments to over 50 MMT versus a USDA forecast for full season exports of just under 49 MMT. Meal sales this week were a disappointment however, at only 53,200 MT for 2014/15 these were down 57 percent from the previous week and 48 percent below the prior 4-week average. New crop was even worse at net sales reductions of 2,300 MT. Meal shipments of 262,000 MT were up 23 percent from the previous week and 38 percent from the prior 4-week average. Cumulative shipments are now at 8.4 MMT, with another 2.2 MMT of outstanding sales taking total commitments to 10.6 MMT versus a USDA forecast for the season of 11.6 MMT. In other news, ahead of next week's USDA June WASDE report a Bloomberg survey came up with an average trade guess for world 2015/16 soybean ending stocks of 96.21 MMT, almost exactly what the USDA themselves said a month ago, and up 12.5% from 85.54 MMT in the current season. US ending stocks were placed at 483 million bushels, down from the USDA's 500 million estimate last month. A Bloomberg survey into trader/analyst sentiment found 6 bullish, 11 bearish and 8 neutral on soybean prices. MDA CropCast were unchanged on their forecast for the US 2015 soybean crop at 3.823 billion bushels, a 3.6% decline on last year's record. Dr Cordonnier was unchanged on his estimate for the 2014/15 Brazilian soybean crop at 94.5 MMT and raised Argentina by 1 MMT to 60 MMT. Both numbers would be records. A report on Bloomberg quoting Canadian analysts ProMarket Wire said that farmers there would harvest only around 18 million acres of canola this year, down sharply from a government planting estimate of 19.4 million, after large areas were wiped out by last weekend's hard frost. Farmers have been struggling to find enough seed to replant, by all accounts. Jul 15 Soybeans closed at $9.46 1/2, up 11 1/4 cents; Nov 15 Soybeans closed at $9.24, up 9 cents; Jul 15 Soybean Meal closed at $305.70, up $3.00; Jul 15 Soybean Oil closed at 34.53, down 20 points. Corn: The corn market closed around 4 cents higher despite disappointing weekly export sales. These came in at 464,900 MT for delivery in 2014/15, which was down 29 percent from the previous week and 31 percent below the prior 4-week average. To add insult to injury there were net sales reductions of 54,800 MT for 2015/16. Trade estimates had been around 550,000 MT to 1 MMT for both marketing years combined. Actual shipments were respectable though at 957,400 MT, even if they were down 11 percent from the previous week and 13 percent below the prior 4-week average. The US has now shipped out 32.2 MMT of corn this season, with a further near 11.3 MMT of outstanding sales taking total net commitments to 43.5 MMT versus a USDA forecast for full season exports of 46.0 MMT. A Bloomberg survey estimated world corn ending stocks in 2015/16 at 192.4 MMT, up a little on the USDA's 191.9 MMT a month ago and versus 192.5 MMT in the current season. US 2015/16 ending stocks were estimated at an average 1.772 billion bushels versus a USDA figure of 1.746 billion last month. A Bloomberg survey into trader/analyst sentiment found 12 bullish, 6 bearish and 8 neutral on corn prices. MDA CropCast were unchanged on their estimate for the 2015 US corn crop at 13.802 billion bushels, down 3.9% from last year's record. They lowered their outlook on the EU to 62 MMT versus 68 MMT a year ago. Dr Cordonnier was unchanged on his forecast for the 2014/15 Brazilian corn crop at 79 MMT, but raised Argentina 0.5 MMT to 24.5 MMT. The Russian Ag Ministry said that 2015 corn planting there was almost 95% complete on 2.7 million ha. Rusagrotrans estimated that Russia would export 250 TMT of corn in June. South Korea tendered for 138 TMT of optional origin corn fro Oct/Nov shipment. The FAO added 7 MMT to their estimate for the global corn crop this year, taking that up to over a billion tonnes. They see world carryout in 2015/16 at 219 MMT, up 2 MMT on a month ago and significantly higher than other estimates from the USDA and IGC. "In Brazil, conditions are favourable. Overall planted area is down relative to last year due to competition with soybeans, which are more profitable. Harvest is complete for the spring-planted crop (lesser producing season) and the summer-planted crop (higher producing season) is in reproductive stages, and conditions remain favourable. In Argentina, conditions are generally good. Harvest is progressing normally owing to good weather conditions," they said. Jul 15 Corn closed at $3.63 1/2, up 4 1/2 cents; Dec 15 Corn closed at $3.81, up 4 1/4 cents. Wheat: The wheat market closed with solid double digit gains across the three exchanges. The USDA reported net sales reductions of 20,400 MT for delivery in now ended 2014/15 marketing year (for the period to May 28). There were net sales of 364,100 MT for 2015/16, which was in line with expectations. Shipments last week were respectable at 406,300 MT, taking the cumulative total for what is now just 3 days short of the entire 2014/15 marketing year to 22.3 MMT. There are outstanding unshipped sales of a further 954 TMT. The USDA forecast for 2014/15 exports is 23.2 MMT. Short-covering may have been a feature today, with some talk of the already sodden US Plains turning wetter again. Quality could certainly be an issue there once the combines finally do get into the fields. 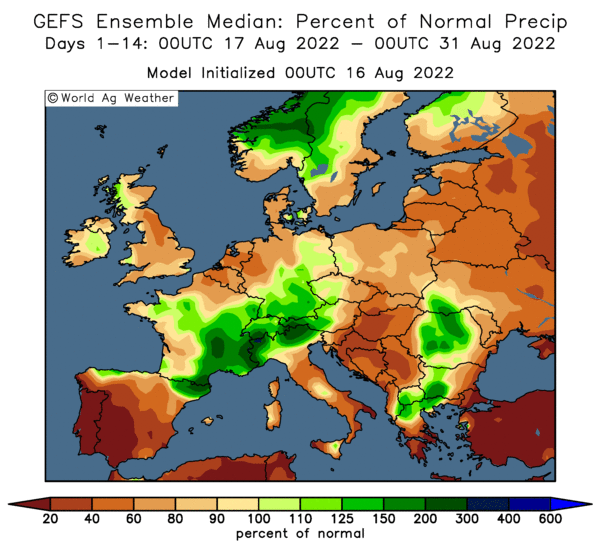 There's also scattered talk of heat and dryness being a possible yield loser in Russia and parts of Europe now too. MDA CropCast cut their forecast for the global wheat crop by 1.1 MMT to 710.5 MMT. They lowered their yield estimates in the US and Canada, but nudged Russia and Europe a little higher. The FAO raised their global 2015/16 wheat production forecast by 4 MMT to 723 MMT, and added 2 MMT to global carryout to take that up to 219 MMT. A Bloomberg survey into trader/analyst sentiment found 10 bullish, 7 bearish and 9 neutral on wheat prices. The average trade guess in their survey into global ending stocks pegged those for wheat at an average 202.36 MMT versus the USDA's May estimate of 203.32 MMT. US carryout was forecast at an average 794 million bushels, almost identical to the USDA's 793 million a month ago. They also canvassed the market for guesses as to the size of the US wheat crop this year, finding an average trade estimate for winter wheat production at 1.466 billion bushels versus the USDA's 1.472 billion in May. The US all wheat crop was estimated at 2.095 billion bushels compared to 2.087 billion from the USDA a month ago. There's some talk of increased Canadian spring wheat plantings due to farmers' inability to source canola seed to replant crops damaged by the recent frosts. Russia said that their spring wheat planting was almost 93% done on 12.1 million ha versus 12.4 million a year ago. Spring barley is said to be 93% planted on 7.6 million ha (versus 8.3 million this time last year). Rusagrotrans forecast Russia's June grain exports at 1.4 MMT including 900 TMT of wheat and 200 TMT of barley. Jul 15 CBOT Wheat closed at $5.23 3/4, up 13 cents; Jul 15 KCBT Wheat closed at $5.41 1/4, up 12 cents; Jul 15 MGEX Wheat closed at $5.75 3/4, up 12 3/4 cents. 04/06/15 -- EU grains closed mixed in another uneventful, limited news sort of a day. Jul 15 London wheat ended down GBP0.75/tonne at GBP114.25/tonne, Sep 15 Paris was EUR1.50/tonne higher at EUR183.50/tonne, Jun 15 Paris corn was up EUR1.25/tonne at EUR157.50/tonne, whilst Aug 15 Paris rapeseed stumbled EUR2.75/tonne lower to close at EUR372.00/tonne. The euro hit a five month high of close to 1.14 against the US dollar on optimism that a Greek deal was close, with the country saying it will make a scheduled payment to the IMF on Friday, although it closed the day well off those levels. The FAO's AMIS released their June crop production forecasts, saying that "the supply outlook for all AMIS crops has improved since the previous month on account of higher production forecasts and inventory volumes. Against this backdrop, international prices of wheat, corn and soybeans remain under downward pressure." They estimated the world 2015/16 wheat crop at 723 MMT, up 4 MMT from a month ago and now only 6 MMT short of last year's record. It is also significantly higher than the USDA's 719 MMT and the IGC's 715 MMT estimates. Global ending stocks were pegged 2 MMT higher than previously estimated, and than they are expected to be at the end of the current season, at 201 MMT. They also added 7 MMT to their world corn production forecast, taking that up to 1.002 billion tonnes, again just short of last season's record 1.026 billion. Ending stocks were also raised 2 MMT to 219 MMT, although that's still slightly lower than 224 MMT at the end of the current campaign. That's far above the IGC's 187 MMT and the USDA's 192 MMT though. "In the northern hemisphere, overall (wheat) conditions remain favourable. In Russia winter wheat conditions have improved and are mostly favourable, although there is some concern over spring wheat as planting is delayed due to wet weather, they said. 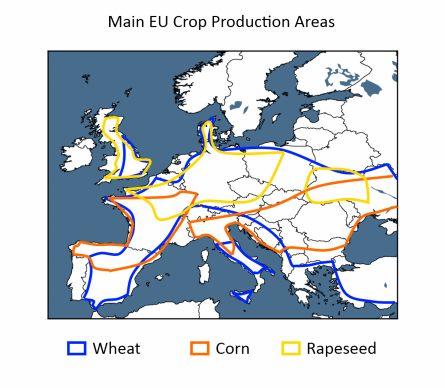 "In the EU, winter wheat conditions are generally good, however, there are two areas of concern, mainly due to water scarcity, in southern Spain and in southern Italy," they noted. "The strengthening of El Niño conditions calls for a close monitoring of crops to be harvested during the second half of this year," they warned. "In Ukraine, conditions are generally favourable and harvest is expected to be above average despite some dry conditions in southern and south-eastern regions," they added. In contrast to the FAO, MDA CropCast cut their forecast for the 2015/16 world wheat crop by 1.1 MMT from a week ago to 710.5 MMT, some 12.5 MMT below the AMIS estimate. They only see production in Europe at 143.1 MMT versus the FAO's 148.5 MMT prediction. Russia said that spring planting there is now 91.8% done on 28.5 million ha, down from 29.3 million ha this time last year. Wheat planting is 92.8% done, corn is 94.6% finished and barley is 93% complete, they say. Rusagrotrans increased their forecast for Russia's grain exports in June to 1.4 MMT, of which 64% (900 TMT) will be wheat as shippers increase pace ahead of the introduction of the new Jul 1 export duty. 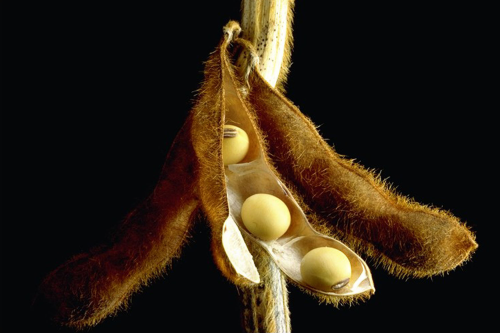 03/06/15 -- Soycomplex: Beans closed lower, as Informa raised their forecasts for production this year in both Brazil and Argentina. For the former they now see output at 95.5 MMT, up 1 MMT from previously and also 1 MMT above the USDA's May estimate. In Argentina Informa now predict a crop of 60 MMT, up 1.5 MMT from previously and also 1.5 MMT higher than the USDA. Washington are due to release their latest supply and demand estimates next Wednesday Jun 10. The Argentine government said that growers there now have nearly 40% of their new crop soybeans sold versus 35% committed a year ago. The Brazilian Trade Ministry said that the country exported a massive 9.34 MMT of soybeans last month, up from the 6.55 MMT shipped out in April and versus the 7.61 MMT exported in May 2014. Meal exports were 1.59 MMT versus 1.20 MMT the previous month and 1.42 MMT a year ago. The US weather outlook remains largely non-threatening. An El Nino summer would probably be conducive for good US soybean yields, particularly in the western corn belt, although it can sometimes bring dryness to eastern states. Oil World cut their forecast for the global rapeseed crop to 67 MMT, down 2.9% on a year ago and 1.1 MMT below the USDA. Note also that the USDA has global consumption in 2015/16 at nearly 70 MMT. 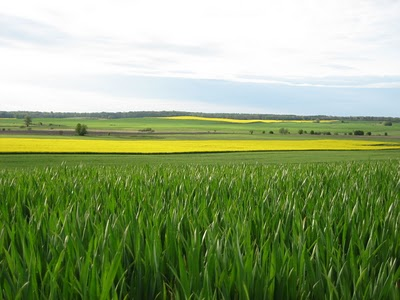 The trade remains concerned about recent frost damage to canola in Canada. Trade forecasts for tomorrows weekly export sales report for beans are in the 250-550,000 MT range for both crop years combined. Estimates for soybean meal are around 100-350,000 MT. Jul 15 Soybeans closed at $9.35 1/4, down 5 1/2 cents; Nov 15 Soybeans closed at $9.15, down 2 cents; Jul 15 Soybean Meal closed at $302.70, up $0.90; Jul 15 Soybean Oil was back on the offensive, closing at 34.73, up 56 points. Corn: The corn market closed with little change. The EU Commission increased their forecast for corn production here from 66.3 MMT to 69.1 MMT, although that's still well below last year's record 77.8 MMT. Informa raised their view on Argentina by 1 MMT to 25 MMT, and also added 1 MMT to Ukraine taking their crop up to 24 MMT. The Argentine government said that growers there now have over 48% of their new crop corn sold, up 10 points on a year ago. 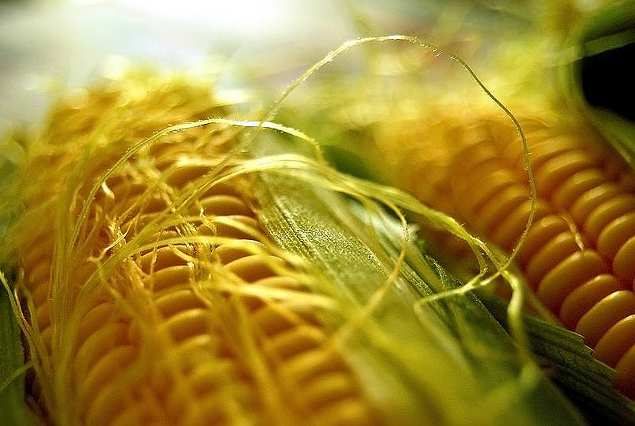 The Brazilian Trade Ministry said that the country exported just 39 TMT of corn in May, down from 159 TMT in April and versus the 127 TMT shipped out in May 2014. The US Energy Dept reported weekly ethanol production at a decent 972,000 barrels/day last week, up 3,000 bpd from the previous week, reaffirming the notion that corn prices have got themselves low enough so that some idled plants have been brought back into production. In the coming years India, which produced 22.7 MMT of corn in 2014, is expected to drift towards planting more corn as it gains acreage from water-intensive crops such as wheat and rice due to depleting water tables, say Rabobank. The country could produce around 29 MMT by the end of the decade, they say, sustaining exports of around 3-4 MMT. The new crop soybean:corn price ratio finished at 2.43:1 tonight. The USDA reported DDGs shipments to China of over 600 TMT in April, the second largest monthly volume exported to the nation ever. It was also nearly two thirds of all US DDGs export in the moth. Taiwan tendered for 130 TMT of US, Brazilian, Argentine or South African corn. Trade estimates for tomorrow's weekly export sales report are around 550,000 MT to 1 MMT for both marketing years combined. Jul 15 Corn closed at $3.59, unchanged; Dec 15 Corn closed at $3.76 3/4, up 3/4 cent. Wheat: The wheat market closed lower by varying degrees across the three exchanges. Informa estimated the US winter wheat crop at 1.481 billion bushels, down from a previous forecast of 1.486 billion following recent heavy rains on the Plains. They did however still increase US all wheat production from 2.132 billion bushels to 2.143 billion, which is also higher than the USDA's current 2.087 billion forecast. The EU Commission forecast a 2015 EU soft wheat crop of 141.5 MMT, down slightly from 141.6 MMT previously and 4.9% below a year ago. Mark Smulders, a senior economist at the FAO estimated the EU all wheat crop also down 4.9% to 148.5 MMT this year. Global wheat production may fall 1.4% to 719.1 MMT, he said. The Argentine government said that growers there now have nearly 77% of their 2014/15 wheat sold versus being 54% committed a year ago. Trade bodies in Russia are appealing to the government to make changes to the new rouble-price based export tax on wheat due to begin on Jul 1. 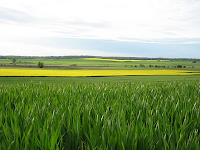 There are some reports that the recent freeze damage to Canadian canola fields in Manitoba, Saskatchewan and Alberta might lead to increased spring wheat plantings, as availability of surplus canola seed is said to be "very tight". The FAO forecast a 7 MMT Moroccan wheat crop, up sharply from 5.1 MMT a year ago, helped by "timely and locally abundant rains". Barley production there was forecast to rise 47% to 2.5 MMT as well. There's talk of some winter wheat being cut again in Texas following recent heavy rains, with some farmers said to be using special rice tyres to get into the fields. There's said to be some evidence of sprouting among what has been cut. Trade forecasts for tomorrow's weekly export sales report are around 150-450,000 TMT. The official 2014/15 US wheat crop year is now over, although this data will only go up to May 28. Jul 15 CBOT Wheat closed at $5.10 3/4, down 1 3/4 cents; Jul 15 KCBT Wheat closed at $5.29 1/4, down 6 1/4 cents; Jul 15 MGEX Wheat closed at $5.63, down 8 1/4 cents. 03/06/15 -- EU grains closed mixed on a no news sort of a day. The session ended with Jul 15 London wheat up GBP0.30/tonne at GBP115.00/tonne, Sep 15 Paris wheat fell EUR0.50/tonne to EUR182.00/tonne, Jun 15 Paris corn was EUR1.25/tonne higher at EUR156.25/tonne whilst Aug 15 Paris rapeseed was down EUR1.00/tonne to close at EUR374.75/tonne. The EU Commission raised their forecasts for both corn and barley production in the union, but pared back slightly that for soft wheat. They now predict an EU corn crop of 69.1 MMT this year, up from a previous estimate of 66.3 MMT, although still down 11% on last season's record 77.8 MMT. For barley they now go 59.5 MMT, up from 58.6 MMT previously, and not too far behind the 60.2 MMT produced last year. Soft wheat production was trimmed from 141.6 MMT to 141.5 MMT, a near 5% reduction on 148.8 MMT in 2014. Rapeseed prices consolidated recent steep gains today, even though Oil World cut their forecast for the global crop to 67 MMT, which is somewhat lower than the IGC's recent 67.8 MMT and the 68.1 MMT currently predicted by the USDA. Oil World's figure represents a 2.9% reduction on last year, and re-enforces the notion that world stocks of the oilseed will get much tighter in 2015/16. Russia picked up 15 TMT of grain in its latest intervention purchase round. The government are paying a little under RUB10,000/tonne for 3rd grade wheat (12.5% milling wheat), the equivalent of around $186/tonne. Intervention prices are said to offer better value than selling to an exporter at the moment, although it's unclear exactly when the government will start buying new crop. The harvest in southern Russia should begin around 4 weeks from now. The Russian National Association of Exporters of Agricultural Products are said to be lobbying the government (along with the Russian Grain Union) to make changes to the upcoming tax on wheat exports that kicks in on Jul 1. Because the new duty is based on the price of wheat in roubles, it carries "big unpredictable risks" given the volatility that's been seen with the Russian currency over they past year, they say. Across the border in Ukraine, their Stats Office reported that agricultural input costs are up 63% compared with a year ago, which will surely have a negative impact on yields in 2015. Ukraine analysts Ukroliyaprom are forecasting increased oilseed production there this year though, with sunflower output at 10.5 MMT, a rapeseed crop of 2.3 MMT and a soybean crop of 4.4 MMT. The latter looks particularly optimistic, with the USDA currently only at 1.9 MMT, although they are also higher than Washington on sunflower (with the USDA at 10.0 MMT) and rapeseed (1.9 MMT) too. Experts are now predicting a "moderate to severe" El Nino event this summer, the effects of which already appear to be demonstrating themselves in various areas around the globe. The Indian Met Office now say that there's a 66% chance of a "deficient" monsoon season there this year, and only a 6% chance of a "normal" one. The latter figure was 28% a month ago. They are predicting 88% of normal rainfall from this year's monsoon, down from the 93% of normal estimated a month ago. The monsoon season is expected to kick off around the end of this week, a few days later than normal. Australia is another country typically detrimentally affected by El Nino, especially in the eastern states where wheat yields usually fall well below average. In contrast, a summer El Nino event frequently brings abundant rains and slightly cooler than normal temperatures to the Midwest, typically boosting corn yields to above trend line averages. 02/06/15 -- Soycomplex: Beans closed with decent gains, posting their largest one-day advance since Apr 1. "The combination of short covering and a lack of appetite on the sell side as the dollar sold off sharply were the primary factors behind today’s move," said Benson Quinn. Generally, speaking the fundamental side hasn’t changed however, they noted. US soybean planting maybe didn't advance as much in the past week as many in the market expected in last night's crop progress report, and plantings are now only on par with normal and not as well ahead of schedule as they were. Old crop demand continues to hold up well meanwhile. Rapeseed prices in Canada and Europe have moved sharply higher, making soybeans look cheap. 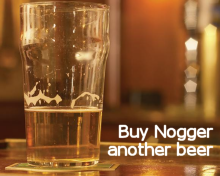 The same could be said for meal. Canadian canola crops in Manitoba were said to have been hit by "extensive" frost damage over the weekend. Stats Canada reported that the country has exported 2.41 MMT of soybeans Aug/Apr, up from 2.38 MMT a year ago. China (780 TMT) and the Netherlands (320 TMT) were the largest homes, but 199 TMT was also shipped to the US where there is a niche market for non-GM beans. Oil World forecast world production of the 10 major oilseeds to fall to 522.4 MMT in 2015/16, down from 528.8 MMT in previous season, with bumper 2014/15 soybean and rapeseed yields unlikely to be repeated. World soybean production is seen falling 1.2% to 314.9 MMT, with rapeseed output predicted to drop 2.9% to 67 MMT. The USDA currently has the world soybean crop at 317.3 MMT, and global rapeseed production at 68.1 MMT. Jul 15 Soybeans closed at $9.40 3/4, up 14 3/4 cents; Nov 15 Soybeans closed at $9.17, up 15 3/4 cents; Jul 15 Soybean Meal closed at $301.80, up $5.20; Jul 15 Soybean Oil closed at 34.17, down 34 points following two sessions of "out-performance" relative to beans and meal. Corn: The corn market closed around 7 cents higher. Again, some in the trade will have been surprised that the USDA only reported corn planting advancing 3 points on the week last night. " there are roughly 3 million acres of corn left to plant at what would typically be considered after the optimal planting window. On one hand, these areas have plenty of moisture. On the other hand, current prices aren’t offering much incentive," suggested Benson Quinn. Colorado, Kansas, Missouri and Texas have the most left to plant. Dollar weakness today was also a supportive factor, along with renewed strength in wheat. The early Brazilian safrinha corn harvest is said to be underway in Mato Grosso and Parana. In Mato Grosso good rains are seen boosting yields, with IMEA predicting production in the state at 17.8 MMT, a 0.5% rise on last year despite plantings being down 8%. Mato Grosso is said to be 1% harvested and Parana is at 2% done. South Korea are tendering for 138 TMT of optional origin corn for Oct/Dec shipment. Russia said that its 2015 corn crop was 94.3% planted on 2.6 million ha. Ukraine said that it was 98% done on 4.26 million ha. There's some talk of the developing El Nino potentially causing some crop losses in China this year, although their domestic corn stocks are so high it is unlikely that this would create much fresh demand for corn on the international markets. Jul 15 Corn closed at $3.59, up 6 3/4 cents; Dec 15 Corn closed at $3.76, up 7 cents. Wheat: The wheat market closed sharply higher in what looks like short-covering and consolidation following recent losses. Rain deluged winter wheat on the southern Plains is finally set to get a break, with warmer and drier weather in the forecast. The market will now be nervous what sort of quality wheat the trade is going to find itself with once the combines finally get a chance to move in. Parts of Oklahoma are said to have received more than 15 inches of rain during the month of May, so some serious quality downgrades are likely. There's trade talk of hot and dry weather potentially being a problem for wheat in Russia, despite constant Ag Ministry assurances that all is well, and that total grain production there this year could/should be anywhere between 95-105 MMT. Russia bought more than 36 TMT of grain at their latest intervention purchase round today, taking the total volume purchased so far to past 1 MMT. There's also talk that the new export duty on wheat could harm exports, particularly of high end quality wheat, later in the year. The Russian Grain Union have reportedly requested that the new duty will only kick in if prices hit RUB13,000/tonne rather than the RUB11,000/tonne currently in the mandate. Rusagrotrans said that wheat exports in 2014/15 could hit a record 21.5 MMT, excluding those to Kazakhstan which the government doesn't class as "exports" as they are part of a closed trade union. Including Kazakhstan total Russian wheat exports could be 22.2 MMT, they added. Jul 15 CBOT Wheat closed at $5.12 1/2, up 18 3/4 cents; Jul 15 KCBT Wheat closed at $5.35 1/2, up 21 1/4 cents; Jul 15 MGEX Wheat closed at $5.71 1/4, up 23 1/4 cents. 02/06/15 -- EU wheat closed higher, although rapeseed has given up some of its recent gains (up 3.9% in the previous two trading sessions) and trades lower. At the finish Jul 15 London wheat was up GBP2.50/tonne at GBP114.70/tonne, Sep 15 Paris wheat was EUR1.75/tonne higher at EUR182.50/tonne, Jun 15 Paris corn was up EUR1.00/tonne at EUR155.00/tonne and Aug 15 Paris rapeseed was down EUR0.75/tonne to EUR375.75/tonne. Nothing has fundamentally changed for rapeseed, and the Aug 15 contract hit new highs in early trade, but consolidated lower by mid-morning. Reuters reported that an unseasonable frost in Manitoba had "wiped out many canola fields" which would now have to be replanted - if farmers can find the seed required to do so at this late stage. Canada is of course the world's largest exporter of rapeseed, and despite the EU being the biggest producer, we are also the largest consumer and thus still a big net importer of the seed. The USDA currently has a 3.25 MMT deficit pencilled in for the EU between production and consumption in 2015/16, so the market here is particularly sensitive to changes in global output and tightening stocks. Elsewhere "in Russia, the south of the country is still suffering of water deficit despite of small rains this weekend. Temperatures, like in France, will approach 30°C in coming days," noted Agritel. This is causing some nervousness in the wheat market, with fund money heavily short in Chicago. Despite official assurances that all is well, and that grain production in Russia could hit (or even top) 100 MMT this year, the trade is not entirely convinced that things are quite so promising as the Russian Ag Ministry would have us all believe. The Russian Vice PM today said that the country could export 25-27 MMT of grains in 2015/16, if a harvest of 95-100 MMT could be achieved. That would be less than they are set to do in the current marketing year (exports were already at 28.75 MMT as of May 27), although not by too much. Private estimates of potential winter wheat yields in Russia this year should start to filter through in the coming weeks, and will be watched with interest. Spring planting in Kazakhstan meanwhile remains retarded, with 62% of the grain crop now in the ground (on 9.12 million ha) compared to 91.4% (13.44 million ha) a year ago. FranceAgriMer reported that the country's soft wheat exports hit a marketing year high of more than 2 MMT in March, a 21% increase compared with a year previously. Of that just under 1.5 MMT went to non-EU destinations compared with 1.17 MMT a year ago. Egypt was the top home taking 437 TMT, followed by Thailand on 238 TMT. Season to date exports (Jul/Mar) are now over 14 MMT, although that's still a little below those of a year ago. Full season exports are expected to hit 18.26 MMT versus 19.17 MMT in 2013/14. Despite a busy export campaign, French May 1 wheat stocks were pegged up 6% at 5.9 MMT, barley stocks were said to be up 17% at 2.5 MMT, and those of corn up 33% at 4.7 MMT thanks to bumper production last year. Algeria said that drought had cut their 2015 grain crop for a second year in a row, estimating production at 3.4 MMT versus 4.9 MMT in 2013. The USDA estimates that they will need to import 7.4 MMT of wheat in 2015/16, up from 7.1 MMT in 2014/15 and nearly 14% more than they did in the previous season. Chicago Grains Mixed, US Weather In For A Change? 01/06/15 -- Soycomplex: Beans closed lower, meal was sharply lower and oil posted big gains for a second session. Oil continued to benefit from Friday's EPA announcement revising up the US biodiesel blending mandate for 2015 to 1.7 billion gallons, up from the 1.2 billion previously proposed. The USDA reported weekly export inspections of only 73,190 MT, a pretty low number even if it did include the Memorial Day holiday. Safras e Mercado estimated the Brazilian soybean crop at 95.5 MMT, a 1.1 MMT increase from their previous forecast. Abiove aren't quite so high, although they did raise their forecast from 92.7 MMT to 93.1 MMT. Oil World estimated Canada's 2015 canola crop at 16 MMT versus 15.56 MMT a year ago, and forecast 2015/16 exports to rise 0.64 MMT to a record 9.3 MMT. The production figure is much higher than the 14.9 MMT from the IGC and the USDA's 14.8 MMT estimate. The Argentine crush workers strike is said to have been suspended until Monday. After the close the trade was looking for the USDA to report soybean planting at maybe 75-80% complete as of Sunday night, up from the 5-year average of 70% done, according to Benson Quinn. However they only reported a figure of 71% complete, meaning that things are only one point ahead of the 5-year average, and are also in fact now 4 points behind this time last year. Maybe the recent plentiful Midwest rains are becoming too much of a good thing? The USDA reported that 49% of the crop is emerged versus 46% a year ago and compared to 45% for the 5-year average. Contrary to market expectations they didn't release any crop condition ratings, so I guess that we will have to wait another week to get these. Jul 15 Soybeans closed at $9.26, down 8 cents; Nov 15 Soybeans closed at $9.01 1/4, down 4 1/2 cents; Jul 15 Soybean Meal closed at $296.60, down $9.10; Jul 15 Soybean Oil closed at 34.51, up 118 points and the highest since early November. Corn: The corn market posted small gains, helped by good gains in wheat. Weekly export inspections of 975,985 MT were pretty decent. The USDA reported that US corn plantings had only advanced 3 points on the week to 95% complete. That's now little different to the 5-year average of 94%, which is also where progress was this time last year. They reported that 84% of the crop was emerged versus 79% for the 5-year average and 77% a year ago. Crop conditions were pegged at 74% good to excellent, which is unchanged on a week ago. "Spring weather has so far been very favourable for corn. Periods of heavy rain have alternated with strong sunshine, promoting strong growth and development. Topsoil moisture is mostly adequate, as less than 10% was short-very short moisture on most Midwest farms late in May," said Martell Crop Projections. "A favourable beginning does not necessarily lead to an abundant corn harvest in the end, however. Out of the last 5 years with similar favourability late in May, only 2 made a productive corn yield," they note. "The El Nino influence is an important factor for corn production as it promotes very generous summer rainfall that boosts the yield. The best rainfall typically favours the western corn belt in Nebraska, Iowa, Missouri, Minnesota and South Dakota. Less heavy rain is more common east of the Mississippi River. Indeed summer drought may develop with an El Nino in Illinois, Wisconsin, Indiana, Ohio and Michigan," they add. Russia said that it had exported 2.69 MMT of corn so far this season, down 29% on a year ago. Exports to Asia have picked up in recent weeks though. The leading Black Sea port of Novorossiysk shipped out 136 TMT of corn in May, a 4.4% increase versus April, with 76% of those exports going to South Korea. 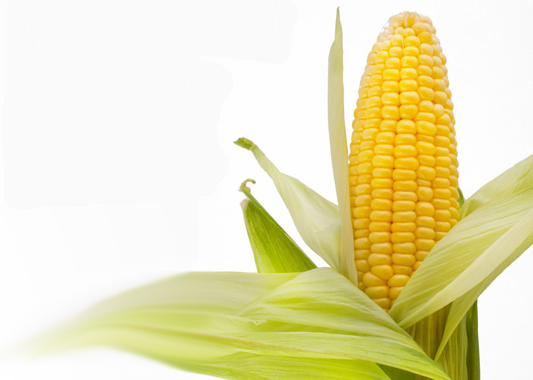 APK Inform said that Ukraine seaports exported almost 365 TMT of corn last week. Russian seaports shipped out 40,600 MT of corn, they added. Russia's Ag Ministry said that it's 2015 corn crop was 93.7% planted on 2.6 million ha. Jul 15 Corn closed at $3.52 1/4, up 3/4 cent; Dec 15 Corn closed at $3.69, up 1 cent. 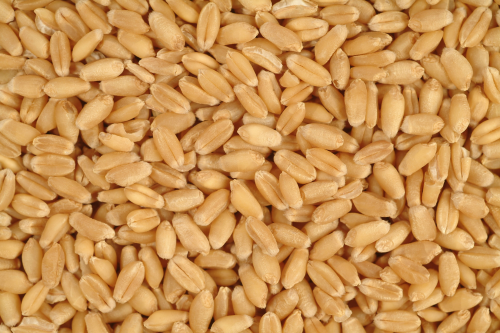 Wheat: The wheat market closed with strong gains. Weekly export inspections weren't too bad at 359,693 MT. The USDA trimmed back winter wheat crop conditions by one percentage point to 44% good to excellent. They said that 84% of the crop is headed versus the 5-year average of 77%. Spring wheat is 91% emerged versus a 5-year average of only 69%. Spring wheat conditions were raised 2 points in the good to excellent category to 71%. Dryness concerns for Canadian wheat remain. "High pressure is stubbornly hanging on in the Canadian prairies, reducing rainfall chances in spring wheat. Less than 40% of normal rainfall developed in May in Saskatchewan and Alberta, the two leading wheat provinces. It’s the driest start to spring wheat planting since 2009," said Martell Crop Projections. US weather is in for a change however. "A sudden reversal in the weather is predicted, just the opposite from what occurred in May. The wave pattern in the jet stream is changing, as the calendar turns over to June. Much drier weather is predicted this week in the southern Great Plains following relentless rainfall in May that flooded Texas, Oklahoma and Kansas," they add. That should allow for some progress to be made with the winter wheat harvest. The market is therefore maybe a little nervous (and thus prepared to bank some profits on heavily short fund positions) in case more widespread quality issues emerge. In other news, Egypt said that it had bought 5 MMT of wheat on the domestic market since it's 2015 harvest began. That's far more than the government's intended 3.7 MMT target, but hardly that surprising when you consider that they are paying local growers the equivalent of around $366/tonne! Russia said that its spring wheat crop was 87% planted and that 88% of the spring barley was in. The Ukraine Space Research Institute, using satellite technology, suggested that winter wheat yields in Ukraine this year could fall 5-38% across the country's 25 oblasts. The mean figure was 20%. Sep 15 CBOT Wheat closed at $4.98 3/4, up 16 1/2 cents; Sep 15 KCBT Wheat closed at $5.23 1/4, up 15 1/2 cents; Sep 15 MGEX Wheat closed at $5.58, up 16 1/2 cents. 01/06/15 -- EU grains closed with decent some pretty gains to start the week and the new month. At the finish old crop Jul 15 London wheat was up GBP2.10/tonne at GBP112.20/tonne, new crop Nov 15 was GBP3.05/tonne higher at GBP122.50/tonne, Sep 15 Paris wheat finished EUR4.75/tonne higher at EUR180.75/tonne, Jun 15 Paris corn was up EUR2.50/tonne at EUR154.00/tonne, whilst Aug 15 Paris rapeseed was jumped EUR10.75/tonne to close at EUR376.50/tonne. The reason for today's sharply higher bounce is difficult to explain, except for the fact that fund money held a record large short in agri-commodities according to the latest Commitment of Traders report released on Friday night, leaving the market vulnerable to a sudden and unexpected upside correction. Ukraine's Space Research Institute (SRI/NAS) said that winter wheat yields there would fall anywhere between 5-38% this year, with mean figure of 20% - an estimate agreed with by independent consultant Mike Lee, who added that losses this year could be even higher. Official Ag Ministry pontifications and forecasts continue to paint a relatively rosy picture, as do those out of Russia. Mike kicks off his second crop tour of Russia and Ukraine at the beginning of next week. He says that he's hoping that winter wheat will be far enough on so that he can see ears and start to make some yield assessment. The Russian Ag Ministry meanwhile say that spring grains have now been planted on 27.2 million ha, or approaching 88% of the forecast area. 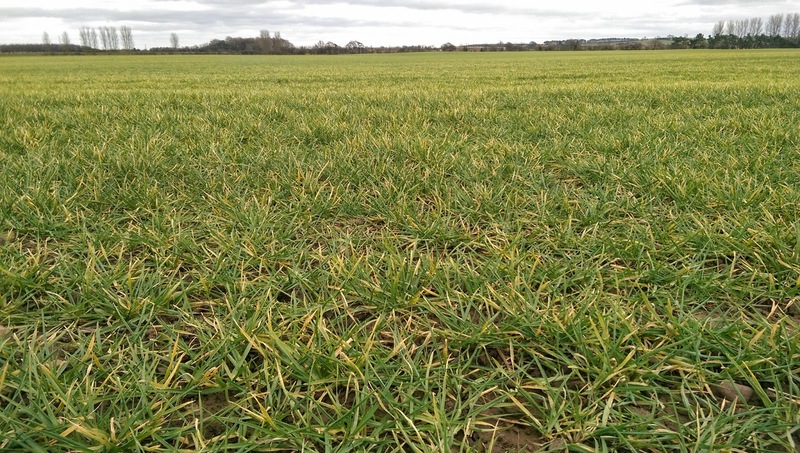 Spring wheat planting is 87% done, with spring barley 88% sown and almost 94% of the corn area now seeded, they say. APK Inform said that Russian seaports exported 185.9 TMT of grains last week, up from 112.3 TMT the previous week. Wheat accounted for 64% (119.6 TMT) of that volume, with corn 22% and barley 12%. Russian's shipments since the export duty on wheat was abolished on May 15 (to May 27) stand at 682 TMT, including 411 TMT of wheat, 154 TMT of corn and 105 TMT of barley. That takes Russia's season to date grain export total to 28.75 MMT, an increase of 18% year on year. Wheat exports are 20.49 MMT versus 17.81 MMT a year ago. On Friday Russia announced the slightly complicated details of the new wheat export duty, which comes into force on Jul 1. This will be set at a minimum of RUB50/tonne (around one US dollar) providing that prices remain below RUB11,000 (around $210/tonne). If prices move above that level then the duty applicable moves up sharply. Rusagrotrans said to Bloomberg that "we didn’t expect the tax mechanism would be so stiff" and suggested that exporters need to step up their activity between now and Jul 1 as "the levy may increase beyond the minimum level toward autumn." APK Inform said that Ukraine seaports had exported almost 421 TMT of grains last week, a small reduction on the near 503 TMT shipped out the previous week. The largest recipient was Egypt taking 67.6 TMT followed by China with 52.5 TMT. Tunisia said that it's 2015 grain harvest will only total 1.4 MMT, a 39% decline on a year ago, due to drought. The country will need to import 2.3 MMT of grain in 2015/16, said their Ag Ministry. EU rapeseed prices moved sharply higher for a second day, on ideas that the 2015 global crop might not be as high as some early season estimates indicated. The IGC estimated Canada's 2015 canola crop at 14.9 MMT late last week versus an Oil World forecast of 16 MMT. The IGC peg the EU-28 rapeseed crop at 21.9 MMT, the same figure currently being used by French analysts Strategie Grains. The USDA are at 21.6 MMT versus 24.3 MMT a year ago, that's some 3.25 MMT below projected demand in Europe in 2015/16. There's some talk that all of those EU production estimates could ultimately prove to be too high still, as plantings were cut back more than official estimates suggest (seen down only 3.1% by the USDA for example). 29/05/15 -- Soycomplex: The entire complex closed higher on the day and for the week. The leading story today was news that the EPA had revised up their biodiesel blending mandate for 2015 to 1.7 billion gallons, up from the 1.2 billion previously proposed. That sent soyoil screaming higher, supporting beans too, although the news was seen as a bit more bearish for meal. Increased soyoil usage equals more soybean demand equals higher meal production, that's the equation that the trade sees. Also supportive for beans today were the one day delayed weekly export sales coming in at a better than expected 322,400 MT on old crop, including 198,000 MT for China. New crop sales of 55,100 MT were however below expectations. Actual shipments of 349,700 MT were up 71 percent from the previous week and 55 percent above the prior 4-week average. That lent further support to the nears. US exporters have now shipped 46.4 MMT of soybeans already this season, and have a further near 3.6 MMT of outstanding sales. Assuming that these also do get shipped, and there's not much reason at this stage to suspect that won't be the case, then that takes total sales commitments to just about 50 MMT - a million tonnes more than the USDA currently have pencilled in with fully three months of the season left to run. That should support the front end for a while longer yet. New crop is a different kettle of fish. The trade is looking for the USDA to report soybean planting at maybe 75-80% complete on Monday, up from the 5-year average of 70% done, according to Benson Quinn. Personally I think that might be a bit too high and would go for a figure of around 72% done versus 61% a week ago. The USDA are also expected to release their first crop condition ratings of the season for beans on Monday. There are reports of a settlement having been reached in the Argentine crush workers strike. Funds were estimated to be net buyers of 11,000 contracts of soyoil and 7,000 soybeans on the day, according to Benson Quinn. Jul 15 Soybeans closed at $9.34, up 8 cents; Nov 15 Soybeans closed at $9.05 3/4, up 3 3/4 cents; Jul 15 Soybean Meal closed at $305.70, up $0.90; Jul 15 Soybean Oil closed at 33.33, up 127 points. For the week that places nearby beans 9 3/4 cents higher, with meal up $1.50 and oil up 169 points. For the month though beans are still down 44 1/2 cents, with meal shedding $9, during which time oil has added 189 points. The new crop soybean:corn price ratio ends the week at 2.46:1 versus 2.40:1 a week ago. Corn: The corn market closed around a couple of cents lower. The EPA report was said to be in line with the markets anticipated numbers, with the 2015 ethanol mandate pegged at 13.4 billion gallons and at 14 billion gallons for 2016. The 2015 figure is well below the 15 billion originally mandated in 2007. Weekly export sales of 654,600 MT for delivery in 2014/15 were down 19 percent from the previous week and 8 percent below the prior 4-week average, said the USDA. A little surprisingly there were net sales reductions of 6,700 MT for 2015/16. The market was expecting net sales of 650 TMT to 1.1 MMT for both crop years combined. Shipments themselves came in at just over 1 MMT, where they have been for six weeks in a row now, and for 8 out of the last 10. Accumulated shipments are now at 31.24 MMT, with a further 11.76 MMT worth of outstanding sales. That takes total commitments to 43 MMT versus a USDA forecast for full season exports of 46 MMT, which is not too bad, although there's less certainty that all the outstanding sales will get shipped than there is for soybeans. US corn plantings are wrapping up, with progress maybe around 97% done as of Sunday night versus 92% complete a week ago. The USDA had 74% of the crop rated good to excellent in their first crop ratings of the season last week, there probably won't be much change on that this time around. The trade is keeping an eye on El Niño sensitive areas including India, Indonesia, Australia, and South Africa, where drought commonly occurs during this weather phenomena. However, in some areas of the world, very heavy rainfall develops with El Niño, say Martell Crop Projections. In the United States, heavy rainfall is common with El Niño in the southern Great Plains, just as has been experienced recently. "Summer rainfall in the Midwest corn belt is typically heavy with the El Niño, promoting strong yields. East of the Mississippi River, drier weather may develop in Illinois, Indiana and Ohio," they add. India, South Africa and Indonesia have all turned dry in recent weeks, further supporting the notion that the predicted "substantial" El Niño event is already here and establishing itself. US corn yields are typically above average in an El Niño year. In other news, Ukraine said that their 2015 corn crop is more or less all in on 4.26 million ha. French corn planting is also over, and FranceAgriMer rated the crop at 88% good to very good, down 2 points on a week and and in line with this time last year. Jul 15 Corn closed at $3.51 1/2, down 2 cents; Dec 15 Corn closed at $3.68, down 2 cents. On a front month basis for the week corn was down 8 1/2 cents and lost 11 cents during the course of the month. Wheat: The wheat market closed with some hefty losses across the three exchanges. It was also sharply lower on the week, but still posted decent monthly gains on the continuous chart. Weekly export sales came in at 42,500 MT on old crop and 253,600 MT on the new crop. The 2014/15 marketing year is virtually over as it runs June-May. Shipments of 494,100 MT last week were up 34 percent from the previous week and 27 percent above the prior 4-week average. The US has now exported 21.9 MMT of wheat this season, and has outstanding sales of a further 1.4 MMT. That takes total commitments to 23.3 MMT versus a USDA target for the season of 23.2 MMT. The USDA left winter wheat conditions unchanged last week at 45% good to excellent. They might do the same again on Monday. Spring wheat was pegged at 69% good to excellent a week ago, up from 65% the previous week, and they might increase that again on Monday, according to Benson Quinn. The weather forecast leans drier for Texas, Oklahoma and eastern Kansas in the fortnight ahead using the GFS model. Other models have all of Kansas turning drier, which would be favourable right now after recent very heavy rainfall. "Australia is prone to severe drought with El Niño. The growing areas most strongly affected are New South Wales, South Australia and Victoria. All are important wheat states. Yet despite a strong El Niño signal, significant rainfall developed in April. The counterveiling influence was a warm Indian Ocean, Australia scientists explained. This promoted a humid atmosphere, conducive to showers. Weather conditions in May have trended drier, however," noted Martell Crop Projections. Kazakhstan spring grain planting has stalled on heavy rain, with only 26% of the anticipated area planted versus 62% this time last year. France reported that their winter wheat crop is 80% headed which is 8 points behind this time last year. Crop conditions are very favourable at 91% good to very good, unchanged on last week and 16 points ahead of this time last year. "Funds were estimated sellers of 4,000 Chicago wheat on the day. Given the last day of the month that was probably the plan all along; however, this action was also spurred by new lows for the move," observed Benson Quinn. The spate of rapid fund short covering that we saw mid-month appears to have now given way to renewed selling. Sep 15 CBOT Wheat closed at $4.82 1/4, down 12 1/4 cents; Sep 15 KCBT Wheat closed at $5.07 3/4, down 12 1/4 cents; Sep 15 MGEX Wheat closed at $5.41 1/2, down 16 1/4 cents. For the week that puts Chicago wheat 33 cents lower, with the market in Kansas down by 38 3/4 cents and Minneapolis losing 27 1/4 cents. On a front month basis CBOT wheat still ended the month 15 1/4 cents higher that it began it, with KCBT up 14 1/2 cents and MGEX adding 21 1/4 cents.